Staurolite: Staurolite crystals forming the typical 60-degree penetration twin from Rubelita, Minas Gerais, Brazil. The specimen is about 1.5 inches tall. Specimen and photo by Arkenstone / www.iRocks.com. Staurolite is a mineral that is commonly found in metamorphic rocks such as schist and gneiss. It forms when shale is strongly altered by regional metamorphism. 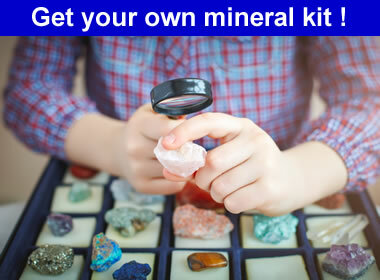 It is often found in association with almandine garnet, muscovite, and kyanite - minerals that form under similar temperature and pressure conditions. Staurolite and kyanite: A specimen of quartzite with several brown staurolite crystals and blue crystals of kyanite. This specimen is about three inches wide and was collected in the Bernina Pass area, near Grischun, Switzerland. Specimen and photo by Arkenstone / www.iRocks.com. Staurolite is a silicate mineral with a generalized chemical composition of (Fe,Mg)2Al9Si4O23(OH). It is usually brown or black in color with a resinous to vitreous luster. It ranges from transparent to opaque in diaphaneity. Staurolite is usually easy to identify when it occurs as visible grains in a metamorphic rock. Grains of staurolite are typically larger than the grains of other minerals in the rock, and they often exhibit an obvious crystal structure. They occur as six-sided crystals, often with penetration twins. Staurolite: Staurolite in schist from Little Falls, Minnesota. Specimen is approximately 4 inches (10 centimeters) across. Twinned staurolite crystals: Twinned staurolite crystals in muscovite schist from Pestsovye Keivy, Keivy Mountains, Russia. This specimen of schist has one pair of staurolite crystals forming a 90-degree penetration twin (lower right) and another pair forming the more typical 60-degree penetration twin (upper left, partially embedded). Specimen is approximately 4 inches (10 centimeters) across. Specimen and photo by Arkenstone / www.iRocks.com. The name "staurolite" is from the Greek word "stauros," which means "cross." 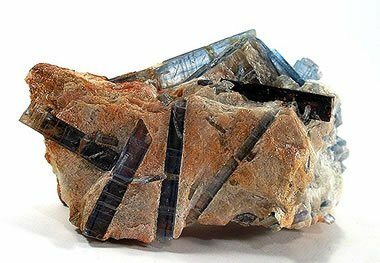 The mineral commonly occurs as twinned, six-sided crystals that sometimes intersect at 90 degrees to form a cross. (An intersection angle of 60 degrees is more common.) In some localities these twinned crystals are collected, made into jewelry, and sold under the name "fairy crosses." 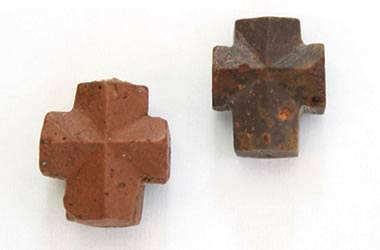 Staurolite "fairy crosses": Staurolite crystals are often collected, made into jewelry, and sold as souvenirs or "good luck" charms. Some of these items are genuine twinned staurolite crystals. Others are cross-shaped models manufactured for the tourist trade. 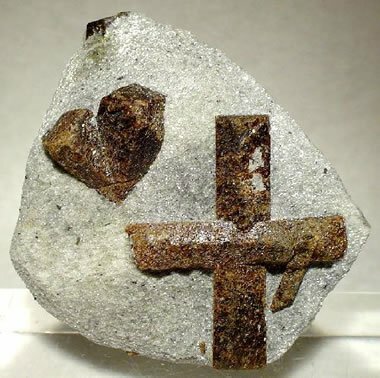 If you see a selection of staurolite crosses offered for sale that are all the same size, same shape, and have air bubbles on close examination, they might be manufactured. There are very few uses for staurolite. 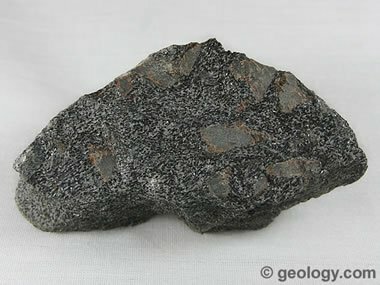 It has been used as an abrasive, but that use has been replaced by other minerals and man-made materials. It is used in geologic field work to assess the temperature-pressure conditions of a rock's metamorphic history. 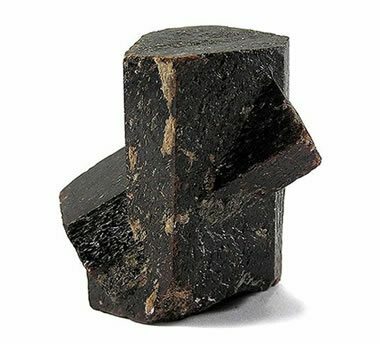 In locations where staurolite is found as well-formed cruciform twinned crystals, it is sometimes collected, sold as a souvenir, made into jewelry, and used as an ornament. The cruciform crystals have often stirred religious beliefs and superstitions. Some of these objects are not staurolite; instead they are manufactured. If you see a selection of these for sale that are all the same size, the same shape and containing gas bubbles, they might be manufactured. Staurolite is the official state mineral of the state of Georgia. It is especially abundant in a few localities in Patrick County, Virginia. One of them is now Virginia's "Fairy Stone State Park," named after the stone and the legends that surround it.